I have enjoyed looking at vintage Christmas images on Pinterest lately. I especially love vintage dog pictures. I've found some wonderful Christmas pictures that I thought you would enjoy as well. 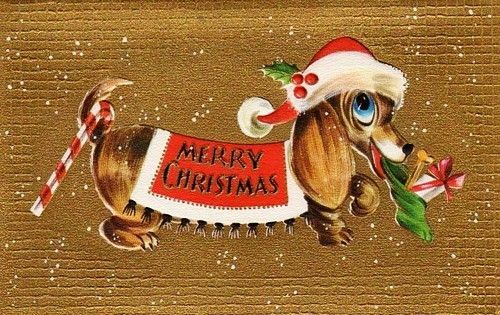 The dachshund on this vintage Christmas card has a candy cane and presents! This little dachshund is helping her person play records. Fun! 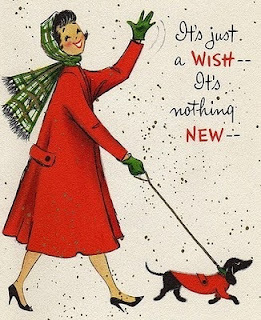 The dachshund on this Christmas card is going for a walk with her person -- they even have matching red coats. 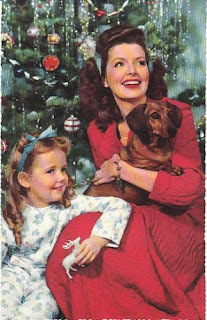 This looks like Christmas morning, with a mother, daughter, and red dachshund. The tinsel on that tree looks like fun to play with! 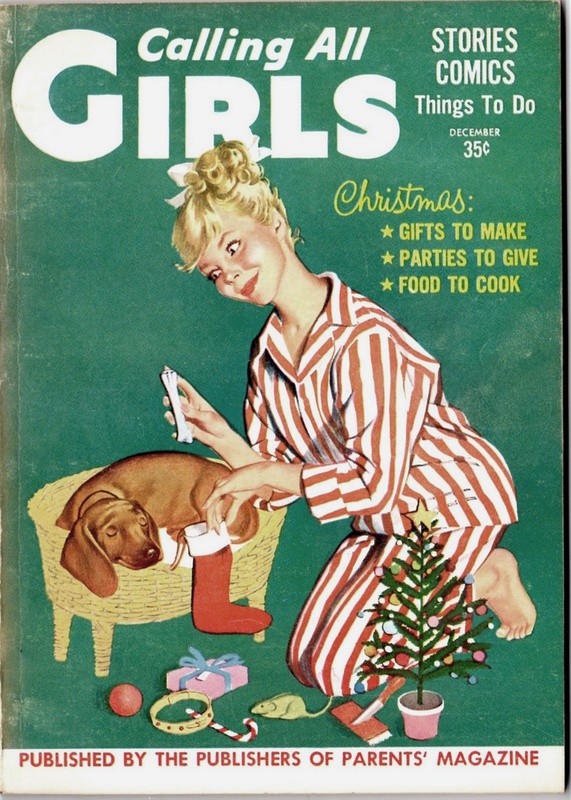 The dachshund on this 1960 Calling All Girls magazine cover is helping her person dress up as Santa. This dachshund looks very excited about his present! This is another Calling All Girls cover (1961). This Calling All Girls magazine cover features a dachshund who is about to wake up to a tiny tree and presents. 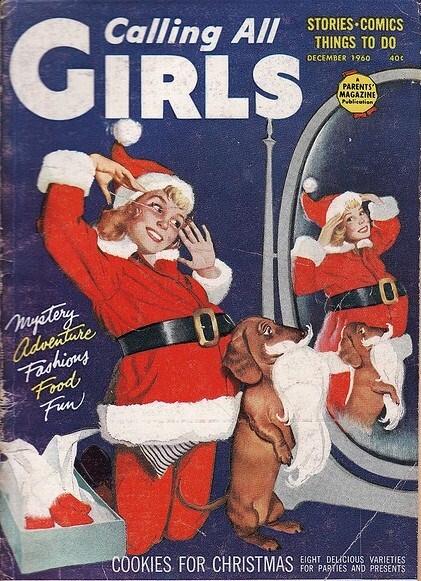 This Calling All Girls magazine features another Santa dress up picture. The dachshund is helping again! I hope you enjoyed these images. Which is your favorite? I like them all, but have a special fondness for the Calling All Girls picture with the tiny tree and presents. I hope you have a wonderful day -- and wishing you a very happy holiday season! I love those! Especially the "It's just a wish, it's nothing new" one! I want all of those :) Thanks so much for sharing! Thanks for visiting! I like that one, too. What a great post! I love all of the vintage ads. I would have to say my favorite one is where the dog is trying on the santa beard. It made me laugh out loud pretty hard! haha! Thanks for sharing Abby! What a lovely post! 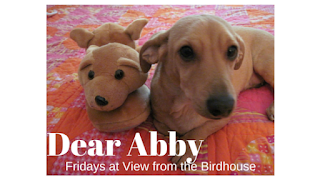 I really enjoy your vintage-themed blogs, sweet Abby. My favourite image in this one is the little dachshund in the red coat with her human wearing a matching one. SO cute! 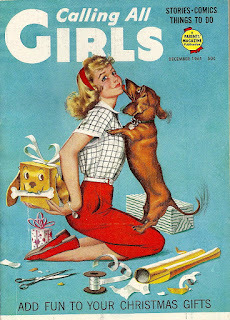 I never realized how much the dachshund has been used opposed to the poodle back then! Very cute! I love these vintage images... they seem to have been from a simpler time!